Manding Jata, is translated the Lion of Mali, in the Mande languages of West Africa. It is written Mandingue Djata in French speaking countries. 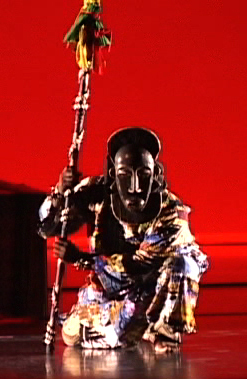 The group was founded in 1996 to tour the music and dance theatre production The Sundiata Epic. The original market for this show was primarily youth festivals and US venues programming a youth component or series. Within five years The Sunjata Epic had been featured at most of the worlds major events for young people, receiving accolades from presenters and rave reviews from the global press. In 2001 Manding Jata was invited to headline the African Renaissance Festival of Dance in Barbados by the Office of the President and the Commission for Pan African Affairs. The group presented a two week residency which included dance workshops for over 100 professional dancers, educational programming for thousands of young people and two sold out public performances at the National Theatre in Bridgetown. The tour included a national press conference, extensive media coverage and rave reviews in both national newspapers. Manding Jata spent the next five years developing the public concert and campus market primarily in the USA, selling out large concert halls and performing coast to coast. After turning down several requests to perform in New York City, the group accepted an offer from the Brooklyn Center at Brooklyn College. This event provided the necessary profile for the desired impact, with media saturation, including the New Yorker magazine, New York Times and a live interview and performance on WBAI radio. Manding Jata used this occasion to launch it’s marquee production Sajoo – “the gathering.” The event was well attended and received enthusiastic reviews from the New York press. This show has evolved into a uniquely individual production combining deeply traditional music and dance repertoire with various circus arts, mime and theatre elements, lighting and optional magic illusions, all contextual to the unfolding narrative. Most significantly, as with all the groups productions, the performance is delivered by the exceptional artists of Manding Jata. This distinguished group of artists come from the Mande region of West Africa – Mali, The Gambia, Guinea and Senegal. The musicians and singers are from the hereditary “jali” caste with an 800 year lineage as musical historians. Most of the artists have held principal roles with the pre-eminant state sponsored companies of their respective countries. From Kita, the cultural capital of Mali, Balla Kouyate is recognized by many of his peers as the pre-eminent balafon player of his generation. He is directly descended from the 13th c. artist, Balla Fesseke Kouyate, father of the Mandinka balafon. Mr Kouyate launched his touring career with the state run Mali Instrumental and has performed and recorded with many renowned artists – most recently Yo Yo Mah. Born in the the city of Kayes (Kayi), to hereditary musical historians Ms. Demba has 700 years of musical heritage on both sides of her family. She moved to Bamako as a young woman and quickly became an integral part of the musical community, performing and touring with Amy Koita, Kandia Kouyate and others. The djelolu first came to North America as the lead singer for Toumani Diabate. Also of singular Kouyate heritage, Amadou is a rising star among West African artists. Audiences are wowed by his brilliant kora technic and engaging stage presence. Amadou Kouyate is the son of the late kora master Djimo Kouyate, co-founder of the National Ballet of Senegal. He also spent a year long apprenticeship in Bamako with Grammy winning kora player Toumani Diabate. One of the “young lions” of African music, Weedie Braimah has performed with a long list of Afro-pop stars including Salif Keita, Youssou N’dour and Baaba Maal as well as jazz icons such as Chick Correa. He is from the Dagbumbe tribal group in Northern Ghana and possesses a comprehensive knowledge of djembe style and tradition. Quoting the Bermuda Royal Gazette – “The lead dancer performed with unbelievable athleticism.” These are sentiments echoed in the press globally. Uniquely gifted and supremely conditioned, “Money” has performed on Letterman, Leno, and Oprah – where he was also a guest interviewee. His dance ethic is uncomprimising, his stage presence riveting. “Money” is an original member of Manding Jata. A Susu man from Guinea, Yalani Bangoura is one of the most coveted African dancers today. He has performed feature roles with the most successful touring companies from Guinea including Ballet Africaine, Cirque Baobab and Merveille de Guinea. His deeply cultural style and unbridled energy has wowed audiences worldwide. A principal drummer with the National Dance Ensemble of Ghana for six years, Mr Ashong developed his Manding repertoire through an exchange program with the Guinea Ballet. His effulgent stage presence and charasmatic dance skills have brought him to the stages of the world with artists such as Angelique Kidjo and Farafina. From Burkina Faso, Daniel Zopoula is of the Bwaba people, a Mande sub-group originally from Mali. His mother is Sissala and he is the 33rd of 35 children. The Zopoula clan were the only “griot” family in the Guaka Djoi region, providing traditional and ceremonial music and song. Daniel Zopoula has toured globally as an original member of Manding Jata and fulfills a unique and inspirational role within the company and among the artists. His persona and stage presence is magnetic. The Susso/Sissoko clan are credited with creating the kora in the 16th c. Mr Susso’s stellar career began when he was appointed as the lead kora player with the Gambian National Cultural Troupe. He has performed for royalty and heads of state globally including four recent US Presidents and with the worlds major symphony orchestras – New York, Chicago, Tokyo (Watanabe), etc . . . Jaliba Papa Susso is an original member of Manding Jata. Abijan was the music and dance mecca of West Africa in the 1990’s and Beche Ako was at the centre of this vibrant community. He was contracted by the touring company Ki Yi M’Bock and toured globally, debuting in America at the Kennedy Center. Mr. Ako eventually exported his own troupe Akunde and settled in Toronto. His dance is marked by deep cultural sensibilities, great speed and agility. Audiences immediately connect with his joyous stage presence. A Susu women from Guinea Conakry, Mariatou Camara came to prominance as a featured artist with Les Merveilles de Guinea and Ballet Africain. She maintains a reputation within the African dance community as an elite artist. Mariatou Camara dances with incendiary vitality. Her joyful stage presence is infectious. A smaller version of the group has also performed at various regional theatres, festivals and campuses in Canada and the United States under the name NOUMOUFASSA. NOUMOUFASSA also presents a program designed for young people entitled The Manding Empire Revealed, which has been presented to thousands of school audiences in the United States, Canada, Australia, and the Caribbean.